We invest in our people, giving them the training, equipment, and support they need, so that they can support you better in the field. Our team is composed of tenured operators who’ve been with us a long time: when you call Elite Vac & Steam, you’ll always get an expert. Let our team show you what great service looks like. We will properly empty, clean, transport, and dispose of anything that has to do with water or sewage. Full shop sumps, residential sewage tanks, oilfield camp tanks, sewage treatment tanks, and more are all in our repertoire. Elite Vac & Steam hauling equipment has incredibly high capacities: with up to 30 m3 capacity. 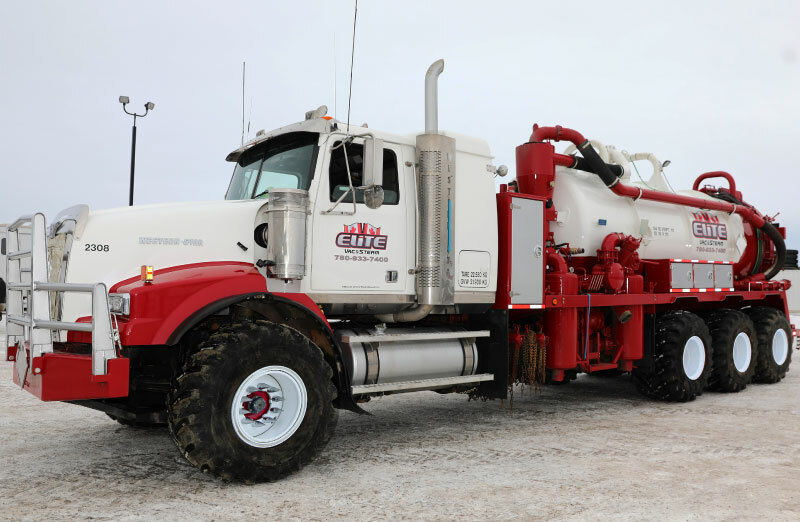 Whether its small or large volume septic jobs, Elite can do them all. For all your septic and sewage cleaning, transporting and disposal needs, you can depend on Elite Vac & Steam. We’ve acquired high capacity equipment so that we can properly deal with your large septic and sewage loads. Based in Grande Prairie, our service area stretches to the Peace Region and beyond. Call us today for access to our full Vacuum & Steam and fluid hauling services. Interested in Septic and Sump Services?